SCVHistory.com | Hi Jolly and the U.S. Camel Corps (AP 1940s). Prospector Convinced Arizona Still Has Camels. Lt. Edward Fitzgerald Beale, for whom Beale’s Cut in Newhall would later be named, led the U.S. Camel Corps on an expedition from Arizona to California in 1857. After the U.S. Army abandoned the short-lived experiment, Beale, who attained the rank of General, used some of the camels as pack animals to carry supplies from Los Angeles to his base at Fort Tejon  passing through the Santa Clarita Valley and the pass that would become Beale's Cut. 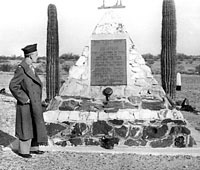 (Above and right) Hi Jolly's tomb in Quartzsite, Ariz. Vacation photos (1940s) showing Lt. Col. Henry Kendall, U.S. Army Engineer, of Shelby, N.C. The famous camel herd with which the name of Hi Jolly is linked constitutes an interesting sidelight of Arizona history ... Jefferson Davis (afterward President of the Southern Confederacy) as secretary of war approved a plan to experiment with camels for freighting and communication in the arid Southwest ... Major Henry C. Wayne, of the U.S. Army, and Lt. D.D. Porter (later a distinguished admiral of the Civil War) visited the Levant with the storeship "Supply" and procured 33 camels which were landed at Indianola, Texas, February 10, 1856. 41 were added on a second voyage ... With the first camels came, as caretaker, Hadji Ali, whose Arabic name was promptly changed to "Hi Jolly" by the soldiers, and by this name he became universally known. His Greek name was Phillip Tedro ... On the Beale expedition (1857) to open a wagon road across Arizona from Fort Defiance to California, the camels, under Jolly's charge, proved their worth ... Nevertheless the war department abandoned the experiment and the camels were left on the Arizona desert to shift for themselves, chiefly roaming this particular section. They survived for many years, creating interest and excitement ... Officially the camel experiment was a failure, but both Lt. Beale and Major Wayne were enthusiastic in praise of the animals. A fair trial might have resulted in complete success. QUARTZSITE, Ariz.  When the desert cools this winter ... when the burn is gone from the sand and the dry air packs a brisk tang, old Bill Keiser is going to get himself a pair of binoculars and look for wild camels. Right now old Bill, a retired prospector and one of the few residents left in this ghost town, is content to sit on his front porch, shielded from the heat waves that dance in the street, and speculate about the camels. He's pretty sure he'll find those wild camels, descendants, he says, of animals brought to this country nearly 100 years ago. "There are sure signs that camels are in these parts," Keiser explained. "Just the other day, for instance, a prospector from St. Louis found fresh camel tracks in the hills a few miles from here." With the first shipment came a caretaker, a short, heavyset, happy-go-lucky Arab named Hadji Ali, whose name was promptly changed to "Hi Jolly" by the soldiers. Today, Hi Jolly's tomb is this town's only attraction. A Texas base for the camels was Camp Verde, a frontier outpost in Kerr county. On the Beale expedition (1857) to open a wagon road across Arizona from Fort Defiance to California, the camels, under Hi Jolly, proved their worth. Nevertheless, the war department abandoned the experiment and the camels were left to shift for themselves on the Arizona desert. Keiser, tough, tanned and 73, got a swig of cool water from the well at the side of his porch. "I'll tell you why the government quit fooling with the camels," he said. "It wasn't because they didn't do a good job. They could carry a thousand pounds of freight 65 miles a day and they went three days without water. But they scared hell out of every varmint that sighted ëem and they caused plenty of trouble. "Hi Jolly told me all about it. Those camels were lonesome for the caravans of their home country and every time they sighted a prospector's mule train they'd make a break for it. You've heard of how horses bolted at the sight of the first automobiles. That wasn't anything compared to the fright those ugly, loping camels threw into mules. The mules would lay back their ears and run for their lives and then the prospectors would cuss and reach for their guns and shoot at the camels. A lot of camels got killed that way. "Prospectors raised so much cain that finally the government just gave up and let the camels go. They found enough food to keep alive ... they'll eat just about anything they can bite, you know ... and they chased mules and aggravated prospectors for many years." The army never explained officially why it abandoned the experiment. Perhaps they proved uneconomical or perhaps the Arizona desert country was too tough for them. Keiser said the rocks hurt the camels' feet. For a time, Hi Jolly wrapped their feet in burlap. Later a special shoe was fashioned for the animals' split toes. The shoes never proved really satisfactory as they didn't keep rocks out from between the toes. Hi Jolly was grieved to lose his animals but took up scouting for the army and also did some mining. He died in Quartzsite Dec. 16, 1902, at the age of 64. 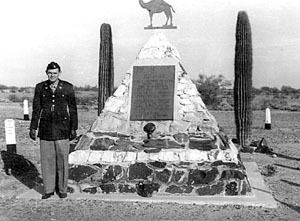 The Arizona highway department has built a tomb for him ... a pyramid of quartz and petrified wood topped by a tin figure of a camel. 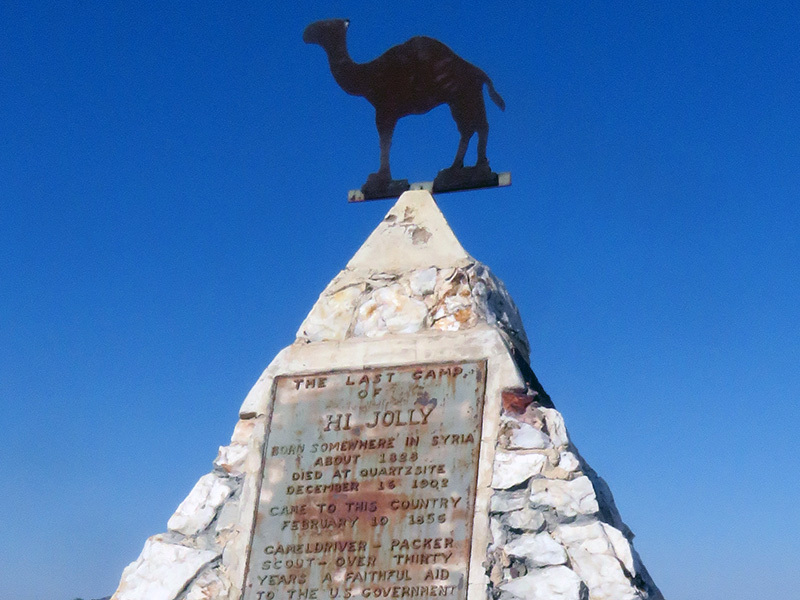 "The last camp of Hi Jolly," a sign says. A native of Pennsylvania, Keiser ran away from home when he was 14. He punched cattle in Texas, once loaded beer barrels in San Antonio and came out to Arizona in 1894. Two sons, Marion and Edgar, live at Lykens, Pa.
Keiser pointed a weatherbeaten hand down the deserted street. "This used to be a mighty lively place," he said. "Once there was eight saloons, right along there. Liquor killed a lot more badmen than bullets ever did. "It sure is quiet here now ... nothing to do but get old and stay out of the sun. "This winter, though, I'll be hunting camels. Maybe I'll get me a camel for Christmas."